Caught the 12.10 pm flight from Gatwick and arrived in Madrid around 4 pm local time. Then took a bus to the city centre and arrived at our hotel at about 5.30 so, apart from a brief walk to a restaurant nearby had little time for site seeing. 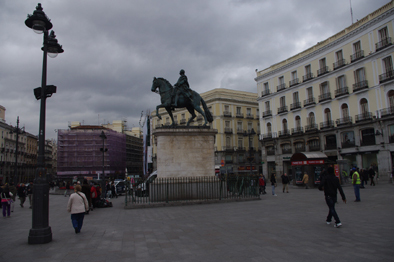 Took a city bus tour the next day starting very near Madrid’s most famous square, the Plaza Mayor. 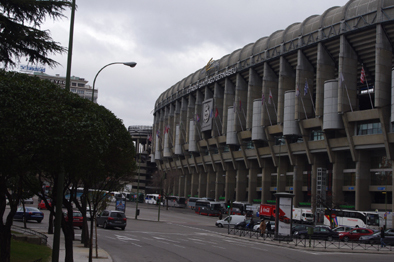 The tour took us passed Real Madrid’s famous football stadium where Manchester United drew in the Champion’s league on 13th February. They are due to play again in the second leg of this fixture in Manchester tomorrow. Last year I was in Lisbon when Chelsea beat Benfica in the same competition and then went on to win the champioship. Perhaps some of the luck I experienced then will rub off on the Manchester team. 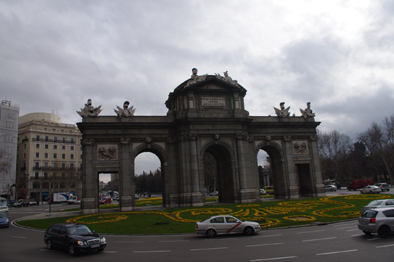 We passed many striking statues on this tour and I was particularly impressed by the Puerta de Alcala, an imposing city gateway designed by Francesco Sabatini. That afternoon we visited the Centro de Arte Reina Sofia which houses an amazing collection of Spanish 20th and 21st century art and saw Picasso’s famous painting, Guernica. Then in the evening we walked down the hill towards the Neptune Fountain and as the clock struck 8 o’clock saw the dancing statues parade on the balcony of the Plusultra Seguras.